Since Carter is schooled from home via K12, we have a special area in our home designated to his lessons. For awhile now, we've desperately needed a bulletin board so that I can keep track of important dates and deadlines. I searched and searched and came across some truly beautiful boards, but the prices are what stopped me in my tracks. "I am not going to spend upwards of $50 on a glorified cork board!" That thought is what led me to create my own pretty, functional bulletin board. I started searching all over the house and in the garage for something that could act as a base for my cork board. That's when I found two old cabinet doors. They were perfect! Here are the rest of the materials I gathered to create my "glorified cork board." To start, I removed the hardware from the cabinet doors. This hardware can be saved for future projects, so I didn't the hinges away. This is what the frames looked like after removing the hardware. I started with four 12 x 12 cork tiles. If I hadn't been pressed for time, I would have searched harder to find cork board that actually fit my doors, instead of having to cut mine down. Unfortunately, I didn't have the time, and these are what I grabbed. I cut the cork board to fit nicely inside of the frame of my doors. I used two 12 x 12 tiles per door, cut to fit. I had to cut one of the 12 x 12 pieces in half. Before gluing down the cork board, I removed it and set it aside so that I could figure out how much designer paper I needed. In order to gauge this, I simply pressed the paper into the cabinet door and pressed along the edges to create a fold. I then cut along these edges. The image below shows what I'm trying to explain. Once I cut my paper, I set it aside and then I lined the edges of my board with painter's tape to prevent Mod Podge from getting on the front of the board. I wasn't overly concerned with the corners, because I knew the paper would cover those areas. Please note that my edges where the cork board meets the frame are not perfect. At all. You can probably do a better job of this than I did. I actually filled in a few of the spots with extra pieces of cork board. Using a glue gun, glue your cork board to the surface of the cabinet doors. Next, bust out that lovely Mod Podge! 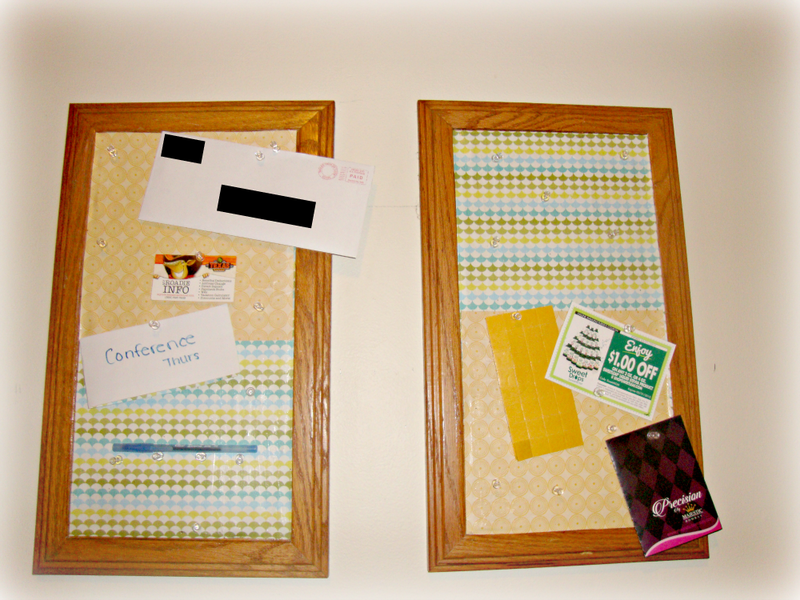 Apply Mod Podge directly to the cork board, then apply your paper. You may go over the surface of the paper with Mod Podge as well. Then, use a flat ruler or a decoupage tool to smooth out any bubbles or raised edges. Now, your board is ready to use!